As a civilized person, you know in your mind that you should not derive pleasure from the pain of others. But periodically it is simply appropriate to do so. That is why the word “schadenfreude” exists. That is what some of us feel about the spectacle of Obamacare unfolding before our eyes. So you don’t have to go running to a dictionary, scha•den•freu•de is a delicious word of German derivation. It technically means a feeling of enjoyment that comes from seeing or hearing about the troubles of other people. But in reality it means so much more. And though some may think it is unbecoming (as our President has said about Republicans in his attempt to change the focus from his failings), to be transpicuous: we are relishing this moment and we have no regrets. President Obama has provided so many points of justification they cannot totally be enumerated. It started with his arrogant and demeaning comment to Congressman Eric Cantor (R-VA and now Majority Leader) that elections have consequences. In other words, I don’t care to hear your opinion. It can be that his signature law was passed with no Republican support and little support from the American public. It could be his lies about people being able to keep their doctor when the plans on the Healthcare.Gov website restrict the usage of doctors and hospitals. It could be his lie about how the average family was going to save $2,500 per year when every study shows most people will be paying significantly more for their premiums, not including their vastly-increased deductibles. Or maybe the lie about how people were going to be able to keep their insurance plans. Then his shock troops write regulations causing somewhere between 50% and 100% of 19 million Americans who have individual insurance plans to be cancelled because the plan they have does not meet the new requirements. There is the lie of the rolled-out benefits. Sure, we are going to give you everything you want and it will not cost a thing. You can cover your children who cannot find a job in the Obama economy until they turn 27 years old. Women can have all the free contraception and tests they want – no cost. Pre-existing conditions: we will cover those like magic. Lifetime caps on your medical coverage magically gone. And because I am the Great Obama, you are not going to pay a dime extra Americans. Of course, until you are 27 years old, you must buy insurance you don’t want or need and pay twice as much as you would if none of these promises were made. Americans are finding out the old rule still applies: you can’t have your cake and eat it too. 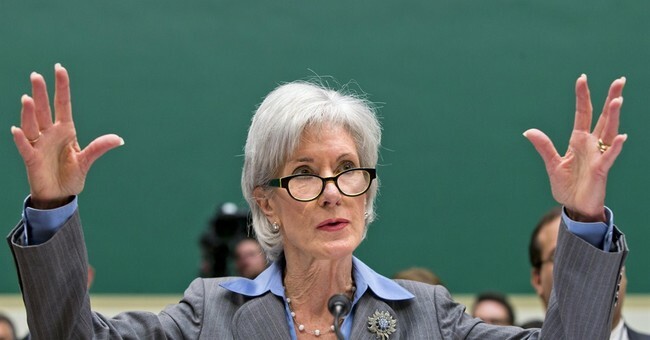 And then there is Queen Kathleen (Sebelius) who has been endowed by her creator (Obama) with arrogance beyond what normal humans can endure. She has exempted her friends (mainly unions) from the rules of Obamacare because she is the omnipotent. Then, when she rolls out her failed website, she tells America it was because she only had three-and-a-half years (and now an estimated $1 billion of OPM) to create it. Poor Queenie says she needed five years to create it and a year to test it. But did you hear from Queenie when Republicans were suggesting a full-on delay of the law? No, because she says “There are people in this country who have waited decades for affordable health care coverage.” Sounds like she was on a mission from God, but it would be so passé for a leftist to invoke the name of the Heavenly Father. Now she is telling Americans to forget that stupid website. You can call us. Since everyone agrees the entire plan hinges on young adults signing up, someone should inform Queenie they don’t make phone calls. In her little bubble she does not know every mobile phone company changed their pricing plans because her targeted fools use data (texting) and not live calls. You ask a young adult if they spoke to someone and they will tell they have, but what they actually did was exchange texts or tweets. And Queenie wants them to hang on the phone for hours to speak to one of her operators who must fill in the information on the exact same website that does not work in the first place. Or she suggests you can make application my mail. We mercifully resist even touching that one. There was a time when people like Queen Kathleen would resign for the good of the country, but that has become a quaint, antiquated custom. Why would we after all this be experiencing schadenfreude? After they excoriated anyone who even suggested that this might not work. After the Republicans during the budget fight came with a final offer to delay the individual mandate for a year and get rid of the insipid medical device tax which is destroying the industry in America and has bipartisan support. No, “we will not negotiate” with terrorist and thugs. Those Tea Party people are just KKK members in different robes. So when we are sitting on our couches watching the mainstream press finally do its job, using words like “debacle” and “disaster” to describe the rollout, how can we not chuckle? When experts say that it is not possible to reconstruct the website by November 30th, what does it mean when the new Czar (Jeff Zients) tells us the website will be working for most people by then? Does that mean if you are a Cardinals fan it will work and if you are a Red Sox fans it will not? When the President loses Ezra Klein of the Washington Post, he has lost the country. Tell us truthfully: are you not sitting with a grin on your face thinking it could not have happened to a nicer group of people?